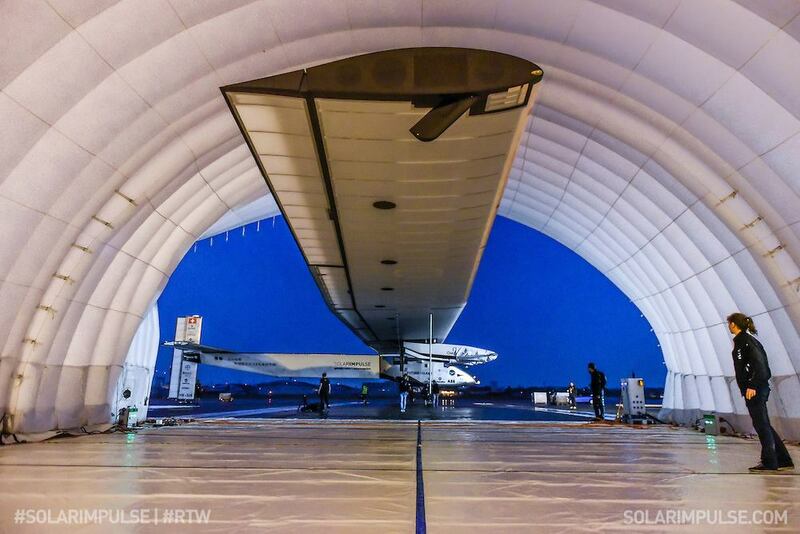 Looking like an igloo condominium, Solar Impulse’s inflatable hangar was hastily shipped to Nagoya Airport in Japan to protect the large, but vulnerable, machine from weather damage. Before the temporary hangar could be installed, though, high winds caused part of the structure holding a cover over the right wing to hit the aileron and cause minor damage. With HB-SIB sheltered safely for now planners scan the weather ahead for the final push to Hawaii. This diversion prevents Andre’ Borschberg from testing the limits of his endurance beyond what will probably be a five-day flight. We continue to wish the pilots and support crew the best of luck and calm, sunny weather ahead.